Gas cookers are the bane of many BBQ critics and the savior to a number of chain restaurants. 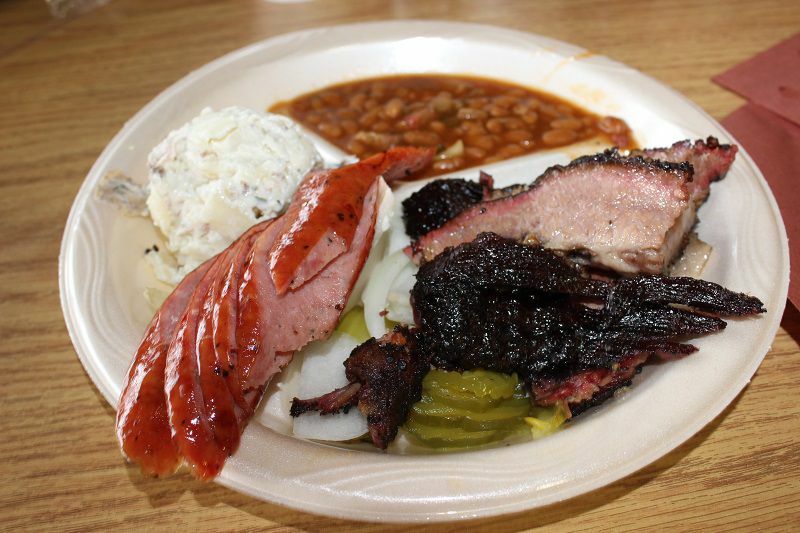 I believe though there is some misconception around how and why they are used, as well as why BBQ from the majority of restaurants who utilize them is often regarded as lower end quality. I have had very good quality BBQ from these types of cookers, and some very bad BBQ from 100% wood fired pits; one cannot rely purely on the presence of one style or the other to predict what the quality of BBQ will be presented from such devices. The two most popular cookers are made by Southern Pride and Ole Hickory. I will skip over the electric models as they are virtually nonexistent in commercial usage at dedicated BBQ restaurants and focus only on the gas units. You may notice both websites use the words “wood burning” in reference to their cookers. Many of the restaurants that employ these cookers also use the words “wood” when referencing their BBQ cooking method. Many of the chain restaurants that use these cookers also emphasize the phrase “wood smoked” when referencing their meat. This is something I’d like to address. Both of these style cookers do use wood. To be more specific they can and should use wood as part of the overall cooking process in order to produce quality BBQ. How much wood utilized is where the cooking process differs greatly with the users of these. Ole Hickory’s website states as few as two fireplace size logs are needed for up to 6 hours of cooking. Both vendors stipulate that one can even use no wood at all in their machines. Celebrated Austin pit master Aaron Franklin used an Ole Hickory pit when at an event in New York. Daniel Vaughn covered it in good detail at this link. If high quality BBQ can be produced then why are these devices so maligned? There are primary two reasons: Laziness and lack of pride. When one uses wood as a primary heat source then the gas will only fire up when the temperature drops below the desired temperature. This means that you can limit the amount of gas used. 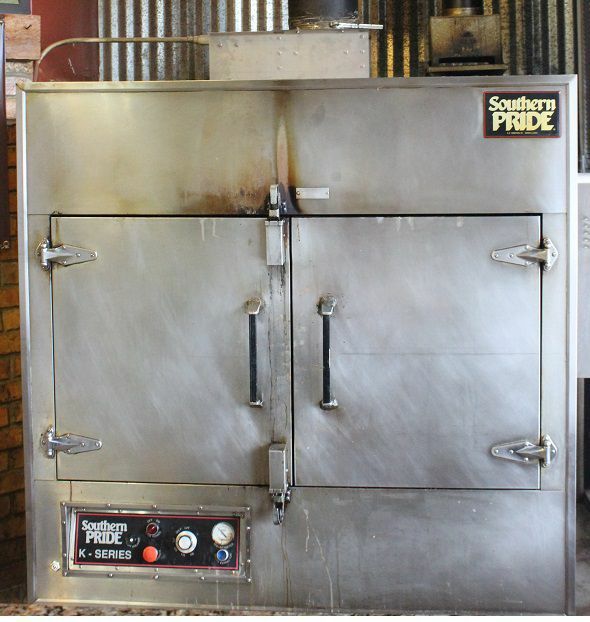 In a recent visit to The Brisket House, I chatted with proprietor Wayne Kammerl about how he is able to produce high quality brisket and beef ribs with a Southern Pride cooker. A full review will be posted soon but he replied to my comments regarding the cooker with his method; “We load it up with wood and let it go through the night, the gas rarely comes on. “ He even told me how low their average gas bill was. This is how you utilize these cookers to their best effect; use wood for more than just a hint of flavor. If these cookers can produce high quality BBQ, then why isn’t there consistently good BBQ when they are used? These devices were created to allow an owner to easily produce consistent BBQ. With options that include rotisseries, it can be a “set and forget” affair. Tending a 100% wood pit is laborious, and costly. Wood has to be procured, stacked, stored, and loaded into the pit when required to keep the temperature in the sweet spot. Most joints will require one or two dedicated pit masters to tend the flames. These individuals may work through the entire night with only small naps to ensure a quality result. Neglect the fire and the temperature may drop. The BBQ may then not be ready when they open in the morning. Load the firebox too full and the meat cooks too quickly, potentially ruining a pitfull of costly meat. Compare this to the potential ease of using a Southern Pride or Ole Hickory: Load the meat, set the temperature, throw a couple of small pieces of wood in, and walk away. No wood? Just fire and go. If you own a chain of BBQ restaurants, keeping quality pit masters on the payroll can be costly and difficult. Once they learn their craft they can move on to their own endeavors or a competitor. With the gas cookers it is possible to produce fair quality BBQ easily with any level of employee skill. This is good enough for many customers, as evidenced by large crowds at some of the chain BBQ locations that use these. At this point I’d also like to point out that the Rudy’s BBQ chain uses 100% wood fired pits. I’ll cover Rudy’s in a future review and quality there can be hit or miss, especially by location, but I think that they don’t get enough credit for using all wood. Ironic in context of the brand name of one of the cookers, I have found that some joints just lack pride in their product. This may be because of the use hourly employees versus those who have some ownership or relationship to the proprietor. I can argue that I have seen happy and motivated employees even at certain McDonald’s locations, so one cannot purely blame the employees. It may be the proprietor themselves. 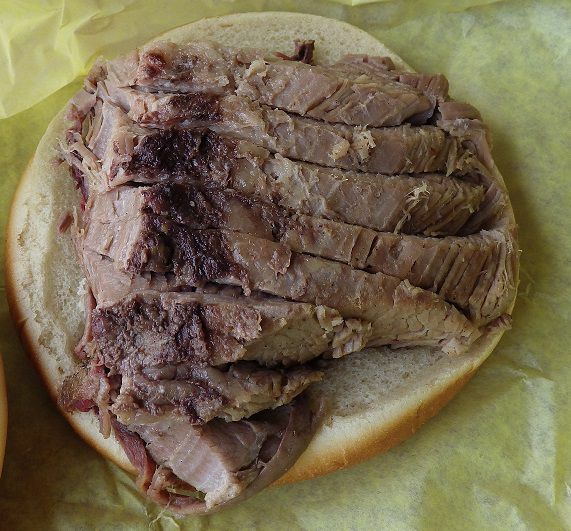 I have seen joints that once were proud of high quality BBQ be sold or transferred into the hands of others who bring in the automated cookers as only one part of a series of changes that transitions the place into a low quality BBQ location. Pride is also a major factor in 100% wood fired joints as well. I have had downright terrible BBQ cranked out of pits burning only wood. So while both laziness and pride is not the exclusive realm of pure wood based smoking, it is critical to the overall production of quality BBQ. As I write this paragraph I think back to the beaming pride in the faces of the pit masters when touring the pits at places like Snow’s, Black’s, Opie’s, Cooper’s, and many others. I have had some wonderful and memorable pit side conversations and it is easy to see pride showing through in the final product. It is possible to produce low quality meat regardless of the type of cooking method. However, I find that it is more common that this is done when a gas cooker is used in combination with laziness and lack of pride. There are a few shining examples of good quality meat from these devices though, like The Brisket House. Don’t fully discount restaurants that use these, and don’t believe that every joint using 100% wood fuel will turn out a quality product.